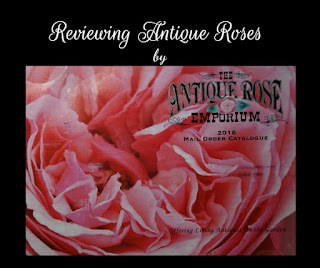 The Antique Rose Emporium 2018 catalog. Do you love Roses? Would you like to grow roses in your garden but believe they are too delicate and difficult to grow? Are you looking for a special, hardy, old-fashioned rose and can't find quite what you want at the local nurseries? If the answer to any of these questions is "yes" I recommend that you shop at the Antique Rose Emporium. What better recommendation is there than word-of-mouth? A few years ago, when I was searching for a very specific rose but had no idea it's name, Renaissance Woman pointed me in the direction of The Antique Rose Emporium. I'm glad she did. Receiving my 2018 catalog in the mail recently reminded me that I wanted to continue to spread the word about the wonderful roses offered at the Antique Rose Emporium (ARE). The Antique Rose Emporium (ARE) is located in Independence, Texas. There you will find their display garden and retail center. If, like me, you are not able to visit them in Texas, you can order from them online and request their catalog. The ship orders within the continental US. It is their philosophy (and in my limited experience with roses, I agree) that old garden roses are hardy and easy-to-grow. Many years ago, I lived in a home that had been the home of a family who had lived there for 60+ years. In that yard was a rose bush that was both adored and hated. It was the most thorny thing and was a chore to mow around. Yet, despite not being pruned or fertilized, or cared for in any other way it provided constant and a profuse amount of little maroon blossoms from the heat of the summer through late autumn. Those small roses had a strong fragrance that floated through the yard and into the house. On days off, I spread a blanket in the yard near that bush and relaxed with a book. I had no idea how much I'd miss that rose bush and how often I would think about it after I moved away. So the search began for a similar rose bush. The problem is, I know next-to-nothing about roses. Didn't know what "hips" were. Double-bloom? Rambler? Remontant? WHAT?! Despite my complete lack of familiarity with describing roses, and trying to recall details about a rose from a decade ago, I emailed ARE to ask if they could help me identify that elusive rose. I expected no response from my strange email request to help find that rose bush. Imagine my surprise when I received a personal response within that same day! 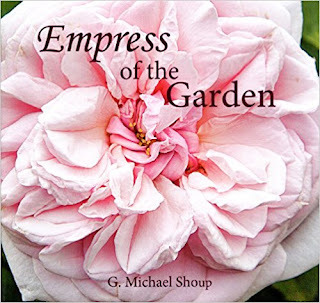 Mr. Shoup described two roses with similar characteristics. And closed with the comment "This is the closest I can get. I think you are describing an old Hybrid Tea that we don't carry". I was astounded that anyone would take the time to respond to my inept description of an old rose bush. In my excitement about the roses they had to offer, I had already ordered a Granny Grimmetts for my yard at The Shack. I received my Granny Grimmetts via the mail; shipped safely in a box and packaging that held it securely. I planted it in my yard at The Shack and the deer immediately stripped it. 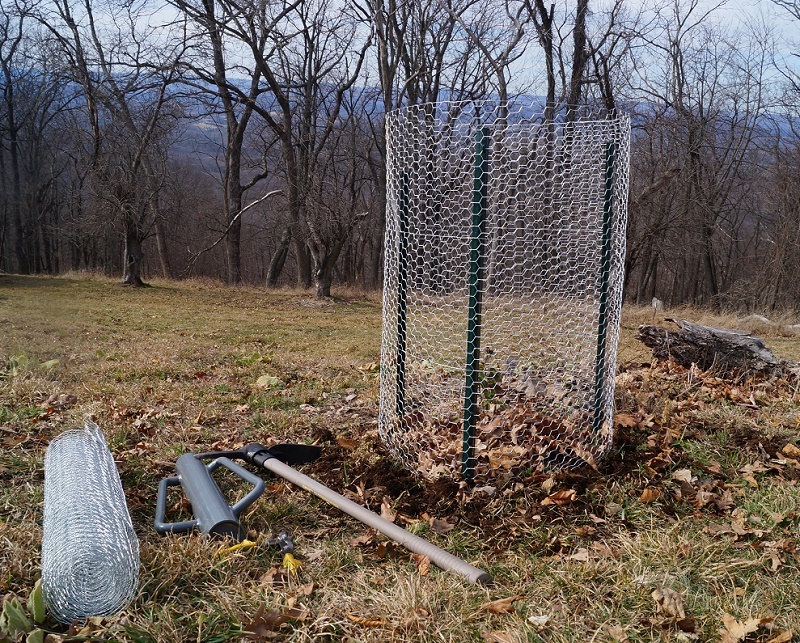 I now know that roses are a delicacy to deer and planting a rose on a ridge in West Virginia was like ringing a deer dinner bell. 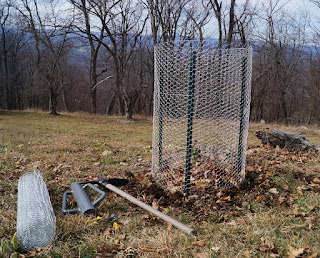 I placed a protective cage around the bush, and something else feasted on that poor plant. I was sure that I had failed and killed that little rose bush but I allowed the cage to remain. And I was thrilled that the following year, that poor victimized rose had grown, put on a few buds, and was doing well! I have since returned to the area where that original rose bush was. I drove past the home and had plans of knocking on the door to ask if I could get some cuts from the plant. Alas, that unruly and thorny rosebush was long gone. But I have my Granny Grimmetts and plan to add the recommended Dame de Coeur.